Join long-time locals on the Whistler Museum’s Valley of Dreams Walking Tour as they lead you through Whistler Village and uncover the pioneer history of the region, tales behind the development of the mountain, and Whistler’s own stories of the 2010 Winter Olympic and Paralympic Games. Stops include Village Square and Olympic Plaza, site of the medal ceremonies in February 2010. 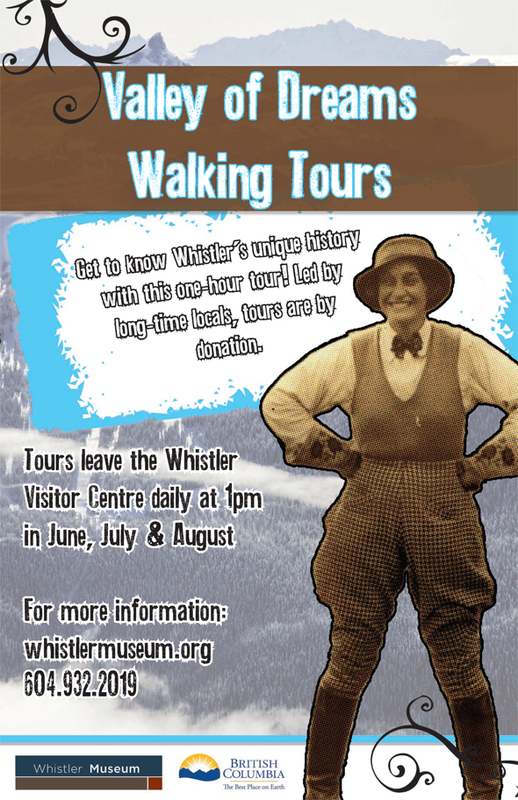 Tours are led daily through June, July, and August and begin at 1 pm at the Whistler Visitor Centre. Following your Walking Tour, come check out the Museum. All participants will receive 25% off admission. All tours are by donation. This entry was posted in News & Events and tagged Valley of Dreams, walking tour. Bookmark the permalink.